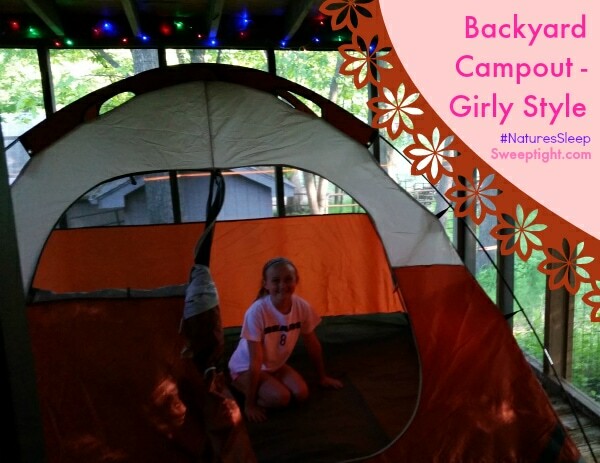 A simple backyard campout is something that can be thrown together quickly and yet, has the power to create precious lifelong memories. And, with Nature’s Sleep Memory Foam, a backache doesn’t have to be what you remember. I am a Nature’s Sleep Ambassador. While I receive free products to facilitate my posts, all thoughts and opinions are my own. We live in a very wooded area right next to forest preserve. We have been talking about having a backyard campout for some time but the coyotes in the area have become quite an issue. So, rather than ruin the fun, we decided to put up the tent inside the screened-in porch. 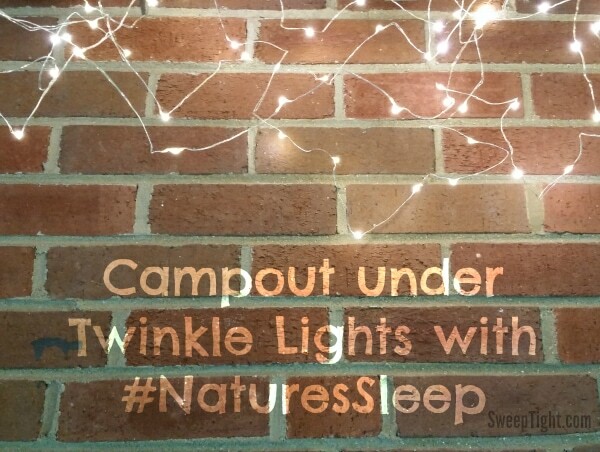 I put up a ton of fun twinkle lights and let the girls use our new Nature’s Sleep Memory Foam topper. Chesney and her friends loved it out there and were even communicating with the coyotes! The girls would howl and then they would howl back! I didn’t think the girls would last all night out there. Even though they were perfectly safe, those nighttime woodland sounds can be awfully scary. But they must have been so darn cozy it didn’t matter because they slept through the night like champs! Although, one appeared to be more rested than the others in the morning. If you have a screened in area, don’t be afraid to use it. Especially if you live in an area with lots of forest creatures and plan on leaving kids out all night, safety comes first. 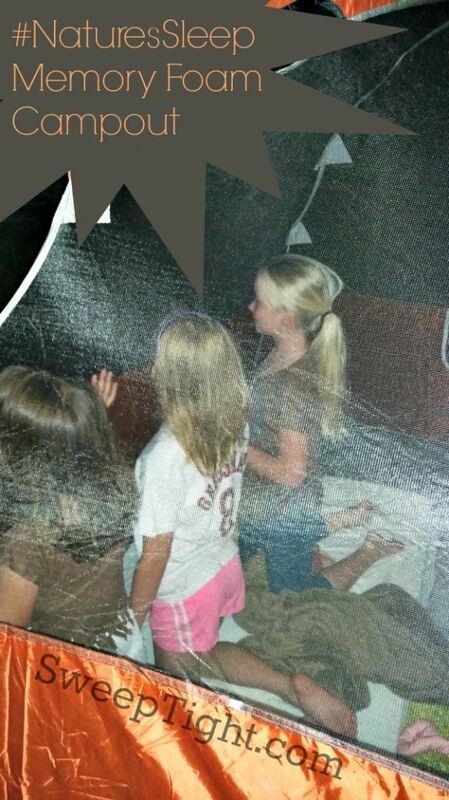 Tents are fun no matter where they are when you’re a kid! Sheesh, I even caught Grandma in there this morning! Duct tape – just have it. This stuff can save lives. Nature’s Sleep Memory Foam – whether you have a bad back or not, a twin topper allows you to get a luxurious night’s rest wherever you are. Biodegradable wipes – I cannot sleep with grimy hands or feet. Maybe I’m a freak, but a quick wipe down makes me feel so much better. hand broom with dustpan – I cannot stand a dirty tent. This is a quick and easy way to get rid of sand, seeds and soot. Don’t forget your friends! Camping together strengthens bonds that will last forever! Don’t miss the bi-monthly #NaturesSleep Twitter Chats! Every 1st and 3rd Tuesday at 1 PM EST simply follow along with #NaturesSleep for your chance to win great prizes! Oh, and there is still time to enter the photo contest to win your mattress! Follow Nature’s Sleep on Facebook and Twitter too! 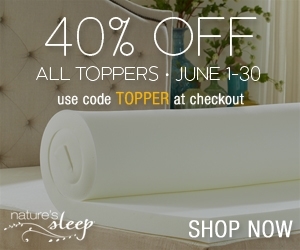 Use code TOPPER for 40% off all toppers and free shipping for the whole month of June! 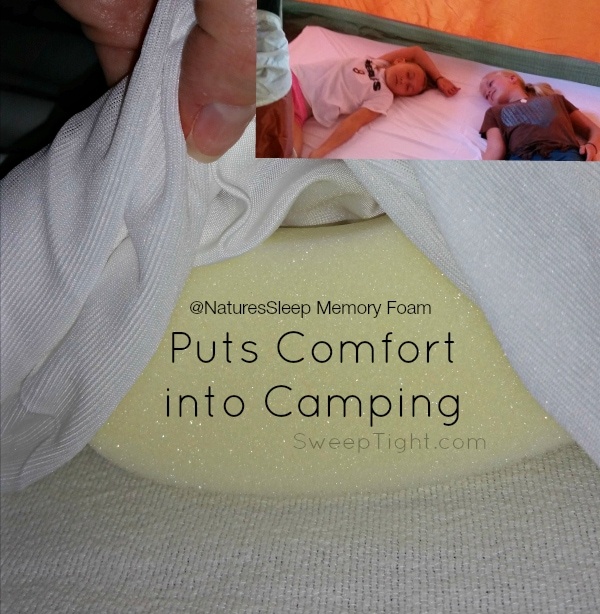 I like the memory foam topper for camping and I bet it really gives a good night sleep. I would love to get one for camping. The kids all looked like they loved camping. It looks like they had a great time!! That memory foam mattress topper looks really comfy, I’d love to try one of those. Thank you for sharing this great post. 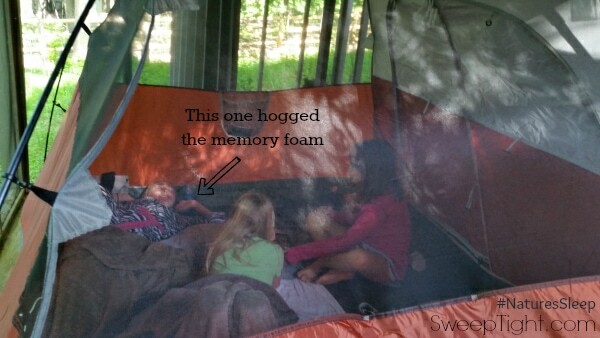 The memory foam sounds wonderful. My grandchildren would have so much fun camping out in the backyard and to have something so comfortable to lay on would just make it so much better.